an organization that helps people who are poor, sick, etc. For many centuries the poor were perceived not as authors but as victims of their circumstances. Therefore, in more religious times, the wealthier members of a parish heeded the biblical teaching – “For ye have the poor with you always, and whensoever ye will ye may do them good:” (Mark 14:7 King James Version) – and many made some provision for the poor in their wills, no doubt in the hope that their place in heaven would be assured. In Goudhurst a number of wills made provision for the parish poor of which the following is a selection. Some bequests were for a one-off payment at the deceased’s burial, some were for ongoing benefit and others were a combination of the two. John Love was a merchant living in Winchelsea where, for a period, he was Mayor. He was related to the Love family of Goudhurst and by his will made a bequest to the poor of the parish. He is buried in Goudhurst. The annuity was to be paid annually on the Feast of St Michael the Archangel (29 September) and there were provisions for the overseers or officers of the parish to levy distress if part, or all, of the annuity was not paid within one month of the due date. He further instructed that if any rent were unpaid by the due date, then the Churchwardens were given authority to levy distress until any debt be fully satisfied. *Richard is probably referring to angel-nobles as the original noble was no longer in circulation. However, a new gold coin, called the angel, had been introduced by Edward IV in 1465; the image on the coin being a representation of the Archangel Michael slaying a Dragon. As it was considered a new issue of the noble it was commonly called the angel-noble. It remained in circulation until the reign of Charles ll and was worth approx. ten shillings. During the 17th century it was increasingly recognised that education should be made available to all children. This is reflected in the wills of John Horsmonden and Thomas Bathurst. In his will, made in 1670, John Horsmonden bequeathed a sum of money to be distributed to the poor of Goudhurst after his death. He also ordered that the sum of £40 per annum arising from land and premises he owned in Tenterden should be paid to twelve of his “loving friends” and that sum should be used to provide a [grammar] school for the youth of Goudhurst . John’s daughter Catherine inherited the lands on which the annuity was charged, but after her death and following the marriages of her daughters, the land was divided and by the early 1800s the annuity was made payable out of a farm at Winchet Hill and other lands allotted to Mrs Clarke. No provision had been made by John Horsmonden for the purchase of premises to accommodate the school. However, in due course, the school was housed in premises leased from the Dean and Chapter of Rochester. By the 1860s pupil numbers had reduced significantly despite advertisements in the South Eastern Gazette promoting the school and, in 1858, amending the curriculum. It eventually closed in about 1864 because the rent on the property had not been paid, with the result that the lease had lapsed and the Dean and Chapter of Rochester had refused to renew it. While the schoolhouse was closed the income from the annuity was accumulated and, under an order of The Charity Commissioners in 1884, transferred to the Official Trustees of Charitable Funds. The funds were to be administered by a governing body known as “Horsemonden’s School Endowment”. The income of the endowment was to be used in maintaining exhibitions to the yearly value of between ten and twenty pounds each at any place of education higher than elementary and to be awarded, on examination or such other test of merit as the governors thought fit, to boys of the parish of Goudhurst. The further amount of five pounds specified in John Horsmonden’s will to provide elementary education to the poor children of Goudhurst was to be paid to the National School (latterly the Church of England School) at Clay Hill. By 1907 the annual income from the endowment consisted of forty pounds bequeathed by John Horsmonden and twenty-five pounds five shillings and eight pence from investments. In 1910 it became part of the Goudhurst Educational Foundation, now a registered charity. Sir James purchased ‘Great Bedgebury’ from Thomas Culpeper in 1682 and rebuilt the manor house in its new location. He was secretary to Prince Rupert and first Deputy-Governor of the Hudson’s Bay Company. The Hayes River that flows into Hudson Bay was named after him in 1684. He died in February 1693 and is buried in St James’ Church, Westminster. His wife, Rachel Lady Falkland died in 1718 and is buried in St Mary’s Churchyard, Goudhurst. Thomas left some farmland in Horsmonden in trust, and income from the land was to be paid by the Trustees to a nominated poor person of Goudhurst at the rate of five pounds per annum, payable twice yearly at Christmas and the Nativity of John the Baptist (24 June), who would teach the poor children living at Riseden Quarter or Kilndown, to read and write. A maximum number of twenty children at a time were to be taught, but as each child learned another would take his place. A sum of twenty shillings was also to be paid annually to purchase religious and good books for the poor people of Riseden Quarter and Kilndown to read. In the 18th century thoughts appear to have turned to providing food for the poor and needy. Henry Fermor willed that wheat should be delivered to the poor of the parish annually whereas Thomas Paris, Thomas Groombridge and Stephen Groombridge willed that loaves of bread should be given to the poor at regular intervals. The latter three were collectively known as the Bread Charities. Sir Henry Fermor was created Baronet of Welches (Walshes, Rotherfield) and of Sevenoaks in 1725. He had married twice but had no children to succeed him. 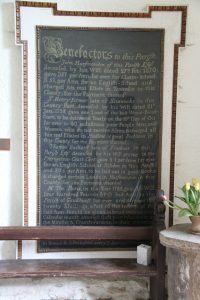 “I give and bequeath to such persons as shall be the Vicar and Churchwardens of the said parish of Goudhurst at the time of my decease the sum of two hundred pounds South Sea Annuities clear of legacy duty upon trust to receive and lay out the interest to accrue due thereon at all times hereafter in the purchase of twenty sixpenny loaves to be distributed on the 3rd Sunday in every month …… amongst twenty poor housekeepers of the said parish not receiving alms at the discretion of the said Vicar and Churchwardens but as my late father Thomas Groombridge by his will… … gave a like sum for the same purpose. It is my will and I direct that the distribution to be made under this my will may not be made to the same poor families at the discretion of the Vicar and Churchwardens and I direct that the same two hundred pounds South Sea Annuities shall be transferred to the Vicar and Churchwardens for the time being of the said parish of Goudhurst upon the trust aforesaid within three months after my decease provided always that I do herein assert that if I shall not at the time of my decease be possessed of South Sea Stock to answer the several legacies of such stock herein before bequeathed then I direct that the same shall be purchased out of my personal estate”. Dorothy was the daughter of Edward and Dorothy Bathurst of Finchcocks. She died on 10th December 1837 at the age of 94. When her death was reported in The Gentleman’s Magazine for January 1838, she was described as “A lady of exemplary piety”. Viscountess Beresford died in July 1851. By a codicil to her will, proved in September 1851, she directed that the trustees of her marriage settlement should, out of the trust monies belonging to her at her decease, purchase or transfer into the names of the trustees of the school in Kilndown sufficient stock to provide dividends clearing the yearly sum of £210. To pay to the Committee of Management of the school the sum of £60 to be used for the annual salaries of the master and mistress by half-yearly payments. For the clothing of the children of such schools as the committee might think fit. £10 for a dinner for the children of the school on every Christmas Day. £10 for a dinner for the children. To provide £4 10s yearly for coal, wood, fuel and lighting of the said schoolrooms. To apply £3 annually for copybooks, slates and stationery. To apply £6 yearly for the purchase of Bibles, Prayer, and other books. To apply £1 10s annually for insuring the buildings. £1-10s in the purchase of: brooms, brushes, pails, flannels and doormats for keeping the schoolhouse and schoolrooms properly clean. To apply the residue for keeping the buildings in repair or towards a fund for such purpose. If any residue is unapplied then the sum should be used to keep the school in Goudhurst in good repair. Anne Frances Mary “Fanny” Cramer Roberts had founded an infants school at Brandfold in 1844. Fanny died in 1847 at the age of twenty one years. Her mother, Mrs Mary Cramer Roberts, widowed in 1843, continued to run the school. In 1852 she granted to Rev. Walter Cramer Roberts, Martha Roberts, Rev. Richard Davis and Elizabeth Harrison (the trustees)… … “a messuage or tenement with the infants school room thereunto attached and the garden thereunto belonging, upon trust to permit the premises to be forever thereafter appropriated and used as and for a school for the education of infant children of the labouring, manufacturing and other poorer classes in the parish of Goudhurst… … and for the residence of… … the schoolmistress for the time being and for no other purpose.” She directed that the school should be called The Brandfold Infant School and “should be conducted in such manner that the education therein given should be conformable to and in harmony with the principles of the Established Church.” Furthermore no person was to be appointed or allowed to continue to be a mistress or assistant who was not a member of the Church of England. At the same time Mary Cramer Roberts transferred £800 consols to the trustees with the proviso that she should receive the income therefrom during her life for the purposes of the school. After her death the income was to be applied by the trustees for the support and maintenance of the school. Mary Cramer Roberts died in 1869. In 1885 the £800 consols were transferred to the Official Trustees of Charitable Funds and in 1886 the school premises were vested in the Official Trustee of Charity Lands, with the Vicar and Churchwardens of the Parish of Goudhurst, along with one other person, being trustees of the charity. However, as a National School had opened at Winchet Hill in 1872, the school at Brandfold was no longer required and the trustees were authorised to sell the school for not less than £120. The trustees were permitted to use a sum of £120 towards the cost of a site and building to be used as a classroom for infants at the Winchet Hill School. Any residue from the sale was to be used to provide a pension of £12 per year to the former schoolmistress (who subsequently died in 1897) and then for payments to advance the education of children resident in the parish of Goudhurst. This trust was not created as part of a will, it was founded s a memorial while the benefactor was still alive. Mary Miller was sister to Giles Miller, a solicitor who lived at Jetwells. She was a lady of independent means who lived for many years at Park Place, Maidstone, where she died at the great age of ninety-eight in 1894. Her companion, living with her at the Maidstone address for many years, was Fanny Louisa Ladbury. In December 1935, six parishioners in Kilndown and 26 in Goudhurst each received ten shillings and in 1940 the same amount of ten shillings was distributed to six parishioners in Kilndown and twenty-five in Goudhurst. Edwin Burr was a farmer, who lived at The Poplars, Winchet Hill. He died in August 1916. Burr’s Gift arises under the Will of the late Mr Edwin Burr. 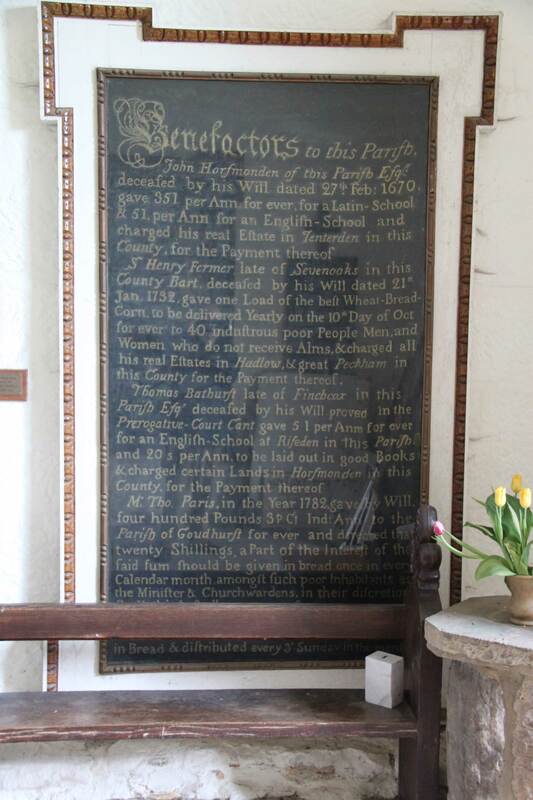 By it he gave the sum of £50, the interest on which was to be laid out every year in the purchase of prizes for the Sunday School Children at Winchet Hill. The fund stands in the names of Mr Burr’s trustees, and the income is paid either to the Vicar or the School Managers who expend it in accordance with the bequest. John Barton made a bequest in his will for a sum to be paid to deserving poor people resident in the parish of Goudhurst at Easter annually. Over time the value of the sums bequeathed by most of these benefactors became so insignificant that they have been ceased as individual charities. They have been incorporated into either the Dorothy Bathurst Trust or the Goudhurst Educational Foundation.